The video for this session can be watched at the bottom of this page. 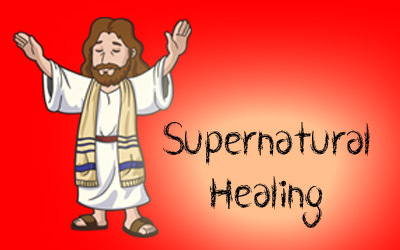 PLEASE NOTE: The term “Supernatural Healing” here simply means healing in a way that is not explained by natural healing methods. Specifically, being healed by God. Miraculous healing is not popular these days. We can’t control it, predict it or explain it. It has been misrepresented by pretenders who want to muscle in on its ability to attract people. It has been misinterpreted by people who want to control it. Most of all, today it is portrayed as an injustice. I has always horrified me that some people could intentionally pretend healing – setup actors to pretend, either to attract crowds, excite faith, or just rip off money. But it has happened. It also upsets me when I hear people claiming that if you have enough faith you will be healed. I know all the bible verses that get used to support the claim, but there is not one person since Jesus who has healed everyone they have prayed for, regardless of their faith. I have prayed for some, and they have been healed. I’ve prayed for others and they have not. I have found no link between my faith (as I recognise it) and healing. The only pattern I’ve found is that when I don’t pray for someone they are not healed. But I’ve heard lots of people try to insist that if your faith is strong enough, you will be healed. All that does it blame the person for their lack of faith if they’re not healed. It is nonsense – God is God, and God chooses. The #1 problem people have today is this sense of injustice. It goes like this: if God is all-powerful and God is all-loving, then this all-powerful, all-loving God would heal everyone who asks. Of course if this were the case, everyone would ask, everyone would be healed, and the world would be very full of people indeed. We would literally live forever in this world. I want to offer you something that has helped me enormously over the years – perspective. I believe in heaven – that world to come and that life to come following this one. I can’t do Q&A about it, but there is evidence enough, and Jesus’ words clear enough on it, that I believe that the promises of heaven are true. In this world I am never going to be 100% well, hence not going to be 100% healed. Our bodies are not perfect, our minds not perfect, our spirits not perfect. We may be headed towards our spirits being healed, but even as that happens our bodies move deeper into brokenness, and our minds are a lottery. In this world I will not be fully healed, only ever partially. However I do believe, when we have cast off our mortal coil, and that which endures makes its way into God’s presence, we will finally be well. This has modified my whole way of looking at healing – medical, natural and miraculous. They are all only partial. If anything they point to what is to come. Death is not defeat for a child of God, it is victory. There are many who say we are better not to play up the heaven thing too much, or we’ll incite people to take their own lives to get there. Again I think this is a fallacy built around not really following Jesus. We are in this world for a reason. We are already citizens of heaven, but we are here for a season. We are ambassadors of God, and purpose for living here. It isn’t our future; it isn’t our inheritance. Our future and inheritance is far greater than anything this world has to offer. What God has done for us is prepare the way so we can be fully healed, and given this future life in heaven. This is what really matters, above all other concerns. This is about eternity, not a few years in this broken world in these broken bodies. The real tragedy isn’t in those who aren’t physically healed now. The real tragedy is in those who have not accepted Jesus and therefore don’t have the Holy Spirit pumping in their heart. That is where real healing is needed, and in that place Jesus is 100% willing. If all of that is true, what value is there in miraculous healing? It is only partial because our bodies are still broken; temporary because everything here is temporary. Personally, in my opinion, it is God’s answer to the demand “prove to me that God is real.” There is no need for God to answer the demand, but here it is. On multiple occasions we see Jesus justified himself by performing a miracle – I will prove I have authority to … be healed! And since they were healed, Jesus proved himself. The miracles pointed to the authenticity of Jesus’ claims about himself and about God. That he healed rich and poor alike showed him to be no respecter of persons. And you might think, by his healings, he showed the great love of God. But that is to ignore the multitudes of people who never reached him because he had moved on. What about the crowds in Capernaum – “we need to visit other towns,” said Jesus, and off they went. Those people weren’t healed. No, if you want to see the compassion of Jesus, you will look to him hanging on a cross. Because there he paid the price for your eventual healing, whether you appreciate it or not. The love of God was on that cross. No, the healing was to get your attention, to show you that God was real, that Jesus was who he said he way, the Messiah, the Son of God and the same as God. And having got your attention he offers you life as only he can offer. This is the unpopular truth, to my mind. Miraculous healing now is not so much about God’s love, as showing that God is still with us. It is not that God isn’t love, but that God’s love is clearest seen on the cross. God can heal you now, but that is only partial and temporary; you will still be broken. God wants to set you free from the power of sin, and give you the inheritance of true healing and eternal life in heaven. That is the primary gift of God in this world. So if I am not healed, I am closer to my real healing and my true inheritance. If I am healed, my healing points to Jesus for others to trust him and receive his life also. This, my friends, really is the love of God at work in miraculous healings, though it works through what matters less and points to what matters most. Video of week 11 of Back to Basics – Miraculous Healing – runs 32:15.